Solidification in spray-forming is still an open discussion in the atomization and deposition area. 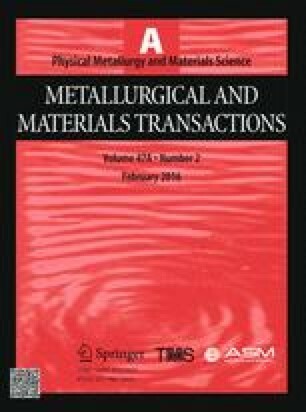 This paper proposes a solidification model based on the equilibrium solidification path of alloys. The main assumptions of the model are that the deposition zone temperature must be above the alloy’s solidus temperature and that the equilibrium liquid fraction at this temperature is reached, which involves partial remelting and/or redissolution of completely solidified droplets. When the deposition zone is cooled, solidification of the remaining liquid takes place under near equilibrium conditions. Scanning electron microscopy (SEM) and optical microscopy (OM) were used to analyze the microstructures of two different spray-formed steel grades: (1) boron modified supermartensitic stainless steel (SMSS) and (2) D2 tool steel. The microstructures were analyzed to determine the sequence of phase formation during solidification. In both cases, the solidification model proposed was validated. Manuscript submitted April 14, 2015. The authors would like to thank the Brazilian institution FAPESP for its financial support.